UPDATE: Due to the flooding situation, the Bangkok Vertical Marathon has been postponed until 22nd January 2012. The Bangkok Vertical Marathon takes place two weeks today on Sunday 29th October at 8.30am at the Banyan Tree Hotel on Sathorn road. 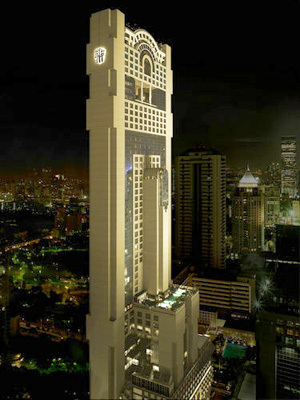 The event isn’t a race 26 miles into the air, because that would be ridiculous, but it is a nonetheless gruelling sprint up Banyan Tree’s 1,093 stairs, starting at the bottom and conveniently finishing in the hotel’s famous Vertigo rooftop bar, perfect for a celebratory cocktail overlooking Bangkok’s skyline. Registration for the 61 floor race is 350 baht with all proceeds going to the Thai Red Cross in support of the HIV Formula Feeding Fund. You can register at the Banyan Tree website or at the front desk. The best way to train for this event is, of course, by running up stairs. Nothing else quite mimics the way your leg muscles are tested. Try using the stairs of a friend’s tall condo if you can. Start with, say, 10 floors and build up. Start by having rests between sets of floors and then reduce the frequency and duration of rests. Get a feel for how hard it is to do 10/20/30 floors in one go – remember that the race is 61 floors, which is 8-9 minutes of high intensity work at a good pace. Another option if you only have a few flights is by training with a partner, tag team style by running up and down 3-5 flights hitting every stair up and down, tagging your partner and then waiting for them to do the same before repeating. Complete 10-20 rounds for a great high intensity workout. You can also do this on your own by timing your breaks but as it’s such high intensity it works better with a partner for extra motivation. This will be my first stair running event, but today I spoke to the winner of the women’s category last year and she told me that it’s best to use the hand rails from the very beginning, not just when you get tired. Makes sense really. Try to take 2-3 steps at a time if you can. I’m really looking forward to this one, should be pretty intense. Good luck to all those taking part! This entry was posted in Bangkok Specific and tagged Bangkok, Events by jackthomas. Bookmark the permalink.